Falls from ladders are preventable, and yet they account for about 20,000 injuries and 300 deaths each year. On March 2, agency staff will discuss lessons from the field during a safety symposium hosted by the OSHA Education Center at the University of Texas, Arlington. The safety discussion, from 9 to 11:30 a.m., will also be live-streamed and can be viewed online. 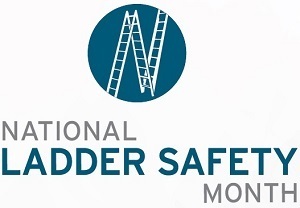 The event is organized in conjunction with the American Ladder Institute’s declaration of March as Ladder Safety Month. OSHA area directors Jack Rector and Basil Singh will share stories of ladder-related tragedies they have witnessed, along with ways those incidents could have been prevented. Ladder safety will also be an important component of OSHA’s annual National Safety Stand-Down set for May 8 through 12. OSHA reminds employers of their obligation to post a copy of OSHA’s Form 300A, which summarizes job-related injuries and illnesses logged during 2016. The summary must be displayed from February through April in a common area where notices to employees are usually posted. Businesses with 10 or fewer employees and those in certain low-hazard industries are exempt from OSHA recordkeeping and posting requirements. Under a new rule, many of the same employers will be required to electronically submit the 2016 data to OSHA by July 1, 2017. A page for submitting records electronically will soon be available. Visit OSHA's Recordkeeping webpage for more information on recordkeeping requirements. Parsons Corporation, a California-based global engineering services firm with 14,000 employees, has been reapproved for participation in OSHA’s Voluntary Protection Programs. The VPP program recognizes businesses that implement effective safety and health programs and maintain below-average injury and illness rates for their industry. Parsons is one of only five companies in the nation with Corporate VPP status, under which companies make a significant commitment to the program. In addition, 23 Parsons facilities across the country have achieved VPP Star status, the highest level in the program. In addition to emphasizing safety and health for its employees, Parsons also is sharing the safety and health culture with its contractors. “Our Environmental, Safety, Health, and Risk Program presents the framework for developing, implementing, and maintaining a world-class Safety, Health & Environment system designed to achieve and sustain zero incidents,” said Dean Harwood, Parsons Executive Vice President, Operations. Through a longstanding collaboration with OSHA, Jennmar Corporation has improved employee safety and reduced its rate of recordable injuries and illnesses by 60 percent. The Utah-based manufacturer of ground control products for mining and tunneling contacted OSHA’s On-site Consultation Program 15 years ago to ensure that it was doing its best to keep its employees safe. Jennmar worked with OSHA consultants to find and fix potential hazards and improve its safety and health program. As a result, Jennmar facilities in Pennsylvania, Utah, Virginia, and West Virginia have all been accepted into the agency’s Safety and Heath Achievement Recognition Program. SHARP status recognizes companies as models for worksite safety and health. For more information, read the success story. Through its alliance with OSHA, the American Staffing Association will host a free webinar Feb. 28 at 3 p.m. ET on “Communicating with Workers about Hazardous Materials.” The webinar will focus on how OSHA can help staffing firms and host employers better understand their responsibilities for ensuring the safety of temporary workers. During this webinar, OSHA Senior Industrial Hygienist Sven Rundman will discuss the hazard communication standard, and responsibilities for providing hazard communication information and training. For more information and to register, visit the webinar website. To help prevent injuries and deaths from grain bin engulfment, several OSHA offices in the Midwest are supporting the OSHA Training Institute’s Education Center at the University of Texas, Arlington in a “Stand-Up for Grain Engulfment Prevention,” March 27-31. The goal is to raise awareness about hazards, protective methods and safety practices to prevent engulfment. During the weeklong event, companies can participate by providing toolbox talks and training on lockout/tagout, fall prevention, and other safety measures. For more information, visit the event webpage. 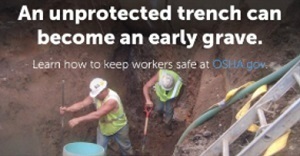 In February, the Kansas City OSHA Area Office provided outreach training on trench safety to more than 100 professionals from the metro area, including fire departments, public works, plumbing contractors and sewer contractors. The training was held at the request of the Grandview, Mo., fire chief following the death of a local worker killed when an 8-foot-deep trench he was working in collapsed. Representatives of three cities that attended informed OSHA that they would not issue permits without evidence of proper trench protection, and would close jobs and cancel the permits if they found a contractor working in a trench without protection. Last year, 26 workers were killed in trench collapses nationwide. Trenches five feet deep or greater require protective systems. To learn more, visit OSHA’s Trenching and Excavation webpage. The OSHA Alliance Program fosters collaborative relationships with groups committed to worker safety and health. OSHA works with these groups to develop industry-approved compliance assistance resources and educate workers and employers about their rights and responsibilities. 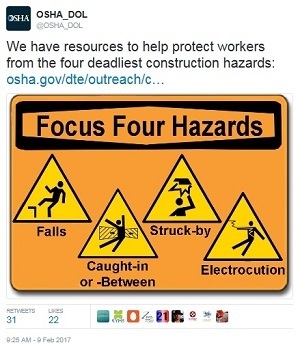 Alliance partners help OSHA reach targeted audiences, such as vulnerable workers in high-risk industries, and give workers better access to workplace safety and health tools and information. Connecticut Safety Society signed a two-year agreement to reduce and prevent construction safety hazards in Connecticut. Puget Sound Shipbuilders Association signed a five-year agreement prevent exposure to shipyard safety and health hazards. The Virginia Department of Labor and Industry’s Virginia Occupational Safety and Health reached a comprehensive settlement agreement with The Goodyear Tire & Rubber Company following investigations of four fatal accidents at their Danville Plant over a one-year period. The agreement includes a commitment to assist the Goodyear Danville Plant towards achieving its goal of becoming a national leader in occupational safety and health by successfully completing the application process for membership in the Virginia Voluntary Protection Program. The agreement also lays out a process for eliminating of the numerous workplace hazards identified during inspections conducted over the last eighteen months. The United States Court of Appeals for the Seventh Circuit has ordered Illinois roofing contractor Robert Barringer III to comply with OSHA regulations and pay $235,000 in outstanding penalties assessed by the agency for past violations of fall protection requirements. Enforcement orders are sought against employers who fail to come into compliance with safety standards. This month, OSHA issued additional citations and proposed penalties against Barringer after inspectors observed roofers working without adequate fall protection at two separate job sites in August 2016. QuickTakes is emailed free twice monthly to more than 170,000 subscribers. You can receive it faster and easier by subscribing to the RSS feed that delivers almost instant information. Visit OSHA's RSS Feeds Web page to subscribe.